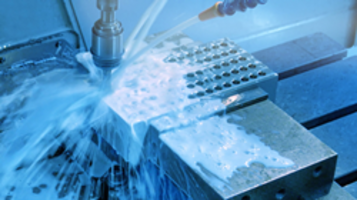 Milwaukee (PRWeb) March 21, 2019 -- A newly released semi-synthetic cutting fluid brings faster cutting times, improved surface finishes and tolerances as well as 20% to 50% tool life extension to a broad variety of metal cutting and grinding operations. BENZ KOOL 1300 provides multi-metal capability that eliminates change-over activities, and its higher lubricity reduces power consumption in every operation. In addition, it contains no chlorine, DCHA, secondary amines, or formaldehyde release biocide. These characteristics are sure to bring higher shop productivity as a result of reduced cycle times and operating costs. Benz is a leading industrial metalworking and lubricant manufacturer that has been developing state-of-the-art technology for over 100 years. Vegetable Based Oil cuts metal and is user-friendly. Synthetic Grinding Fluid offers low foam and mist. Metalworking Fluid carries Boeing BAC5008 RevU approval. Lubricant is designed for tough operations on hard metals. Water-Soluble Cutting Oil suits ferrous and nonferrous metals.